The Ice House Hotel in Mayo is truly one of Ireland’s coolest hotels. A surprising retreat, the hotel is perched on the edge of the River Moy Estuary in North Mayo. Lovingly restored from its historic status as a 19th Century “Ice Store”, today, transparent modern glass structures marry the original 19th century building with cool and contemporary additions. The two very distinct interior design styles are woven in to an eclectic mix. Together they form the perfect accent to the amazing views that stretch across the River Moy to the woodlands beyond. The Ice House Hotel is a member of Ireland’s Blue Book. It boasts 32 luxurious bedrooms and suites, waterside hot tubs and outdoor sauna, the intimate Chill Spa and it’s amazing outdoor spa garden and hot tubs, chic design and a standard of food by Chef Anthony Holland that’s celebrated by the Country’s leading critics. The Ice House Hotel has teamed up with TheTaste to offer you the opportunity to enjoy its luxurious rooms and beautiful surroundings at a very special rate: treat yourself to 2 nights for two in a Deluxe Room with full Irish breakfast, 3 course dinner, €30 spa credit and late checkout for €299. After staying at the 4 star Ice House Hotel, we at The Taste can personally recommend this as a pure luxury escape with food from a Top Chef. And luckily your luxury escape package includes a 3 Course Meal each in the Hotel Restaurant, which stunning views of the river and Belleek Woods opposite. This is one of the most romantic culinary escapes in Ireland. As you dine overlooking the river you will enjoy fresh locally sourced seasonal vegetables, the finest meats and a team passionate about creating the very best dishes possible. Each morning you will awake to a delicious breakfast and will have lots of time to treat yourself with a €30 Spa Credit in the hotel’s much acclaimed Chill Spa. If you like clean lines and a contemporary feel then the Deluxe rooms at this boutique Mayo hotel are for you. 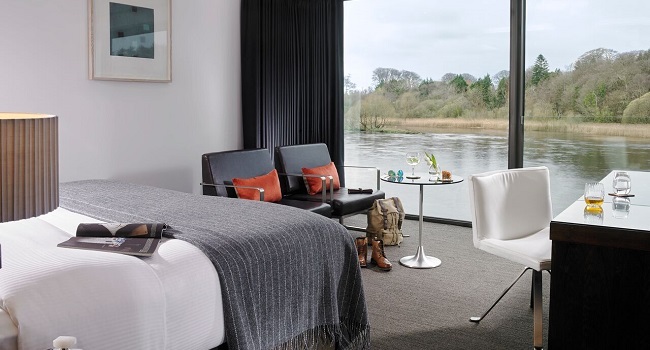 Step inside and you’ll be blown away by the breathtaking view through the floor to ceiling windows across the River Moy to the woodlands beyond. With modern furnishings, mood lighting and polished stone sinks, our Deluxe rooms are the perfect place to kick your shoes off and stay a while.